Astronaut and STS 41 G Space Shuttle Challenger Pilot Jon McBride delivered an Inspiring Imagery Focused Keynote Presentation at the 2018 OCC Photographers Event held in Embassy Suites Resort Orlando,Fl Thursday September 27th. Longtime friends of Astronaut Jon McBride Paul and Emily Kubica owners of Laserchrome Technologies Melbourne, Fl secured Astronaut McBride as Guest Speaker at the OCC Event and produced complimentary composite images for autograph seekers. Photographers and Artists from Brevard, Indian River, and Central Florida Counties viewed Spectacular Imagery of Earth and Space photographed with high resolution large format cameras , OSTA pallet, and IMAX camera on NASA's 6th flight of the Space Shuttle Challenger October 5,1984- October 13,1984. Astronaut McBride detailed NASA's 13th Flight of the Space Shuttle program was the first crew of 7 including Pilot Jon McBride, Commander Robert Crippen, Sally Ride, Kathryn Sullivan, Marc Garneau, Paul Scully Power, David Leetsma, Robert Thirsk . Astronauts Sally Ride and Kathryn Sullivan were identified by Astronaut McBride as the first two women Shuttle crew members with Astronaut Kathryn Sullivan becoming the first woman involved in an EVA. He invited Photographers to visit and bring their cameras to the Kennedy Space Center Visitor Center. 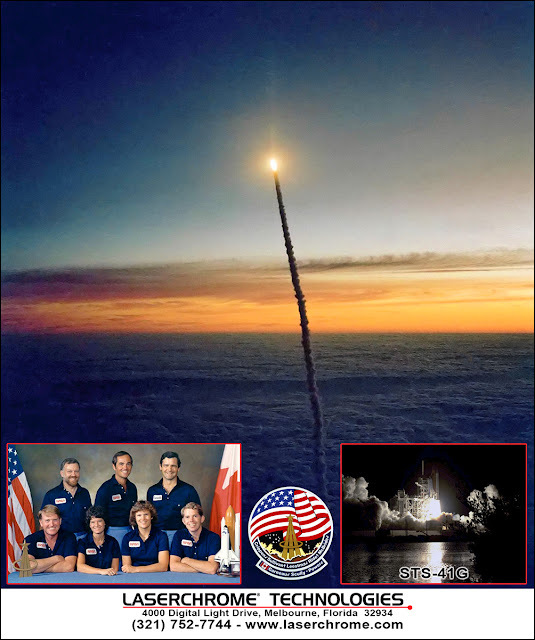 Below is the composite image of the STS 41G Launch Photos October 5,1984 7:03 AM, Crew Photo, and Patch.